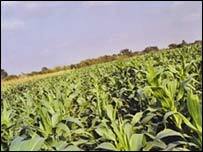 A Zimbabwean who moved to the UK 14 years ago and missed white maize - his country's staple crop - so much he began growing it in a field near London, has become one of Britain's most successful small farmers. David Mwanaka, 40, has grown 20 acres of white maize in a field near Enfield, on the north-eastern outskirts of London - despite the fact this is hugely difficult to do as white maize usually only grows in a hot climate. He spent six years trying to find the best ways to grow white maize in Britain's colder climate. 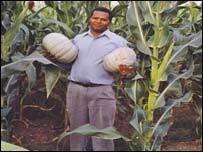 Mr Mwanaka told BBC World Service's Outlook programme that it was "almost impossible" to grow white maize in the UK. "What I've always been told is that you can't grow white maize in Britain. In countries where white maize is grown, the growing season is a bit longer than in this country," he said. Initially, Mr Mwanaka took on a number of low-paid jobs when he first moved to the UK in 1991, including a parking attendant. But during this time he made several efforts to grow the white maize in his back garden in Essex, eventually achieving success in his fourth year of trying. In 2002, he decided to quit his job in a bank and become a full-time farmer. He placed an advert in the classified newspaper Loot seeking arable land. Although he received no replies, a journalist with the Guardian newspaper saw the advert and contacted him. When the journalist wrote up the story, offers began to come in. White maize is a relative of the corn normally grown in the UK and is an important staple food in many African countries. Mr Mwanaka explained that white maize is "much sweeter" than British corn, and has a much higher starch content. But unlike British corn - which Mr Mwanaka "could not stand eating" - it is relatively little-known in the northern hemisphere. White maize is usually grown in South America and southern parts of Asia as well as Africa. Mr Mwanaka said that it had been "very difficult" to convince people he was serious about growing the maize in the UK. "Some people said they needed to see it to believe it - and then when they saw it, they said they wanted to taste it, to make sure it was really white maize," he added. "I have got people from many countries who come to buy white maize from us - people from east Africa, west Africa, southern Africa, and some from Asia and South America as well."